One day sooner than we think, when America is no more and nothing but sand stretches away Ozymandias-like where Los Angeles and New York and Chicago used to be, perhaps travelers from another planet will alight on our once grand land. Our futuristic friends aren’t dumb. They know it’s some kind of encoded digital information on that slice of silicon. So they hustle it back aboard the ship and down to the lab, where an intern discovers they have an old device around that can read it. The team settles in on a couch, or whatever such creatures sit on in the future. Maybe they grab a bowl of popcorn – now genetically modified only, of course. And they hit the play button. A picture whirs to life. A well worn but still visible likeness of a world long gone powers up. They see dancing and singing characters, high speed routines and jokes sharper than steel, extravagant costume and pageantry – and screaming, delighted, INSANE audiences. They listen to music that infects their pre-programmed circuits, lyrics that cut to the quick and speak of love. Faster than you can say Havana, everyone in that ship is singing along, cracking wise about guys and dolls, calling each other Nicely-Nicely and Harry the Horse – and wondering about this superior ancient culture that could have created something so utterly mesmerizing and unique, so soaringly romantic, so unapologetically beautiful and life-giving. Ready to roll (the dice). Photo: Jenny Graham. 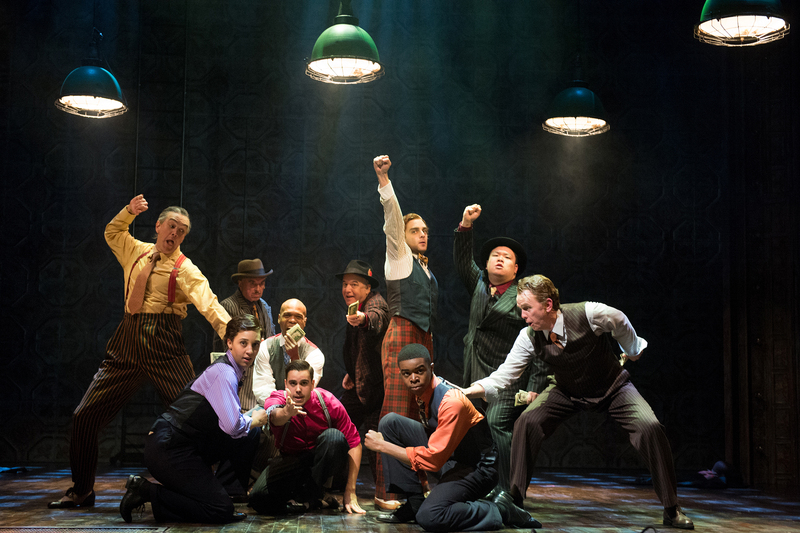 What more is there to say about GUYS AND DOLLS at OSF? Not much really. Or too much – everything. You just have to experience it. It’s like that 4000 calorie desert you can’t stop eating – you’d much rather be eating it than talking about eating it. And when you’re done, how was it? “It was good.” Actually it was better than good. 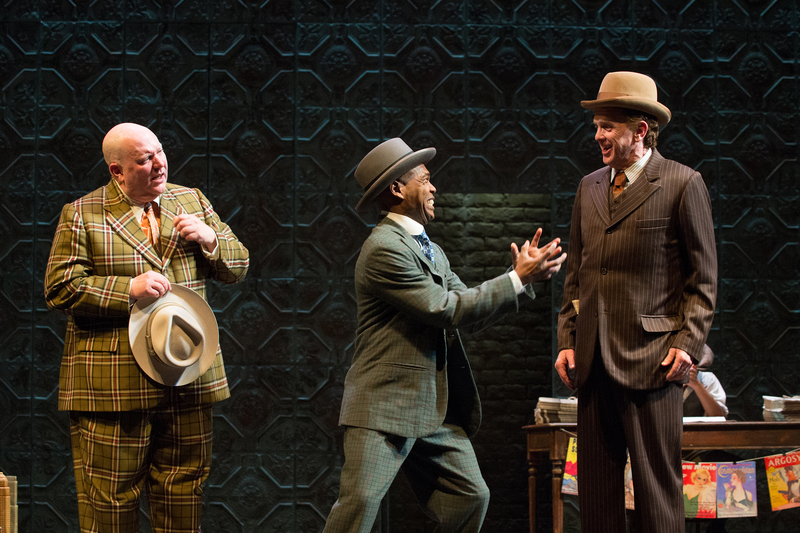 GUYS AND DOLLS is a leviathan of entertainment. As any number of physical structures tower over and define the American landscape, this show dominates the musical theatre imagination as if it were 100 stories high. It’s bright lights, big city, huge heart. Every year at OSF there are several shows you could see multiple times. Recent examples include THE PIRATES OF PENZANCE, THE COCOANUTS or THE HEART OF ROBIN HOOD. And this year the magical GUYS AND DOLLS is one of those blockbuster repeat offenders. In fact you’ll need to see it twice if only to watch the simply incredible second act number “Sit Down, You’re Rockin’ the Boat” again. In this song, which expands into its own mini show within a show, Zimmerman and choreographer Daniel Pelzig demonstrate just how much can be discovered if you know where to look. There are several other sequences (the crap game, the opening tableau) that will also repay repeat visits handsomely. First the material. The reason musicals like this one will endure until the last asteroid in the galaxy with life on it flies off into a black hole is because of story and character, both of which G&D has loads of. In fact, in the opening number alone (Fugue for Tinhorns), there is so much rich texture to be excavated you could have a whole ‘nuther musical about the boys down at the track. Every single inch of the show is drenched in delightful New York dialect and humor. Nathan Detroit (Rodney Gardiner, front left) can’t seem to get Sky Masterson (Jeremy Peter Johnson, right) to take a bet on strudels and cheesecake. (with Robin Goodrin Nordli, Curtis Holland). Photo by Jenny Graham. Take some small time gamblers, save-a-soul drummers, a worn down cop one step behind, gorgeous dancers, a night club and of course the city of New York vibrating in song all night – and what you have is a show. And at the center, Nathan (Rodney Gardiner) and Adelaide (Robin Goodrin Nordli). A hit musical needs to fuse story with melody and rhythm. You know a good song when you can remember it the next morning. After seeing G&D, you’re going to be singing all the way back to Portland or wherever you came from. You may even find yourself choreographing full numbers with your travel mates at rest stops or in the gas station store. Go ahead. Turn to the cashier and start singing: “I got the horse right here….” Chances are they’ll jump in with no further prompting. Musicals do that. They’re like a virus. They take over your body in a physical way more completely than any zombie ever could. They make you do things you had no intention of doing – like singing “I’ve never been in love before” as you cycle down Siskiyou, or “Luck Be a Lady” as you mow the lawn (remember, the neighbors are watching) or “Take Back Your Mink” as you drive down I-5. Musicals make you dance in cross walks or sing in line at the DMV. Once you’re infected, you’re a carrier and your job is to spread the gospel to the faithful. Miss Adelaide (Robin Goodrin Nordli) self-diagnoses her situation. Photo by Jenny Graham. Here there’s no need to try to focus on the story or even remember what’s happening. 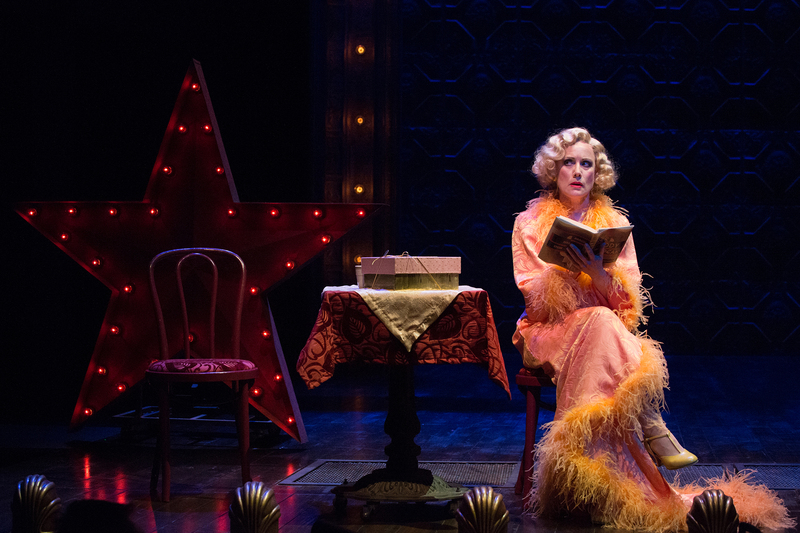 The story comes at you like a Broadway bus, and riding along is effortless. The tunes become the story. The lyrics are themselves music to the ears. It all wraps together to deliver a rich experience in glorious glamour that flies along. No doubt more than a few audience members in the front row of the Bowmer have been tempted to jump the orchestra pit and join the fray. Mary Zimmerman has spared no expense or imaginative effort in rendering this exquisite overture to the American century and old New York. Everything looks great and snaps like a pair of suspenders corraling Big Jule’s copious waist line. There is color, neon, high and low class and smashing tough guy and sweet goirl style. And there is detail waiting everywhere to be discovered. It’s there when the shoeshine boy swipes a drink, when Sky grabs something out of the garbage, when David Kelly flips a hat effortlessly across the stage. Seek and ye shall find, as they say in the bible. Naturally a show like this the size of the Grand Canyon is going to have many, many OSF stars in the mix. The air is thick with double and triple threats. Daniel T. Parker in his plaid suit is a Nicely-Nicely for the ages. The ever versatile and omnipresent David Kelly (who BTW has been killing the [REDACTED] out of it at OSF for so many years now in so many different roles it’s getting ridiculous) is in the middle of it as Benny Southstreet (and a few other parts). Catherine “Log Lady” Coulson is a formidable General Cartwright who gets to deliver the news that the mission is – gasp! – closing down. And the perfect Kate Hurster is Sarah Brown, a crusader who gets a taste of the sauce – and love – that is going to change things. Rodney Gardiner as Nathan is smack dab in the middle (wait – I just started singing another classic show tune of the same name) and has hysterically funny control and precision. Jeremy Peter Johnson is a suave and toughened Sky Masterson (that’s Obadiah to you, sweetheart) whose facade starts to soften thanks to Sarah. Tony DeBruno is perhaps my favorite of the entire lot as Harry the Horse. What a voice. And Richard Elmore as Big Jule scowls and threatens his way into out hearts. But wait – taking the entire show, wrapping it up like a diamond in a pink bow and bringing it home for safe keeping is Robin Goodrin Nordli as Adelaide. Get wise to the game. Take a tip from the Telegraph. And I don’t mean on Epitaph. Follow the fold and stray no more. Except do stray to just one place: Ashland. 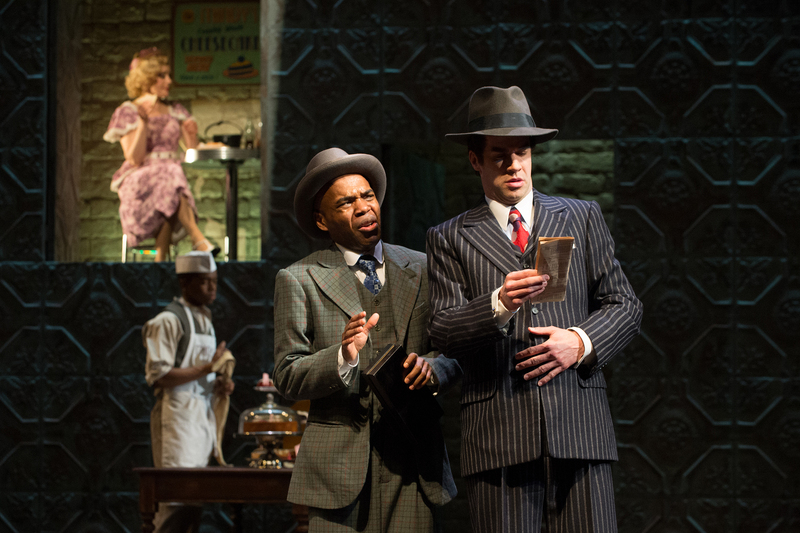 Put your faith in guys and dolls – and get thee to GUYS AND DOLLS.